(Description: 255 characters) A celebrity favourite, Planet Cake has created wedding cakes for Nicole Kidman and Keith Urbans wedding and Celine Dions 40th birthday. We make celebration cakes of all types including birthdays and corporate brand events. Established in 1996, Planet Cake is owned by Paris & Billy Cutler and is based in a commercial kitchen operated by 10 staff located in the heart of Sydney’s iconic and artistic mecca, Balmain. Planet Cake creates cakes daily for celebrations of all types including birthdays, weddings and corporate brand events and a celebrity favourite. Couture cakes Planet Cake operates an online store that sells wedding, birthday and christening cakes and also sells cake decorating supplies. However it is Planet Cake’s decorating school which attracts the most interest. Planet Cake has taught cake decorating classes since 2004 and due to their popularity has appeared on television shows such as Getaway, Fresh & Sydney Weekender. At Planet Cake we have over 8000 cakes in our library; however our specialty is to create something unique for you. You either have the option of choosing directly from our fashionable online cake collection or if you want something uniquely yours we offer a couture service where we will create a unique design especially for you. Couture cake tastings and design consultations are by appointment only and are scheduled from Monday to Saturday 10am to 5pm. N.B. prices for all couture cakes begin at $400. 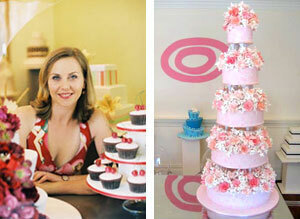 Because all of our couture cakes are designed individually we are only able to give pricing estimates. However the main cost drivers are based on the number of people you are serving, the level of service you require and how much art work is involved in the cake. (image caption)Established in 1996, Planet Cake is owned by Paris & Billy Cutler and is based in a commercial kitchen operated by 10 staff located in the heart of Sydney’s iconic and artistic mecca, Balmain. Delete this text and start typing your message here. 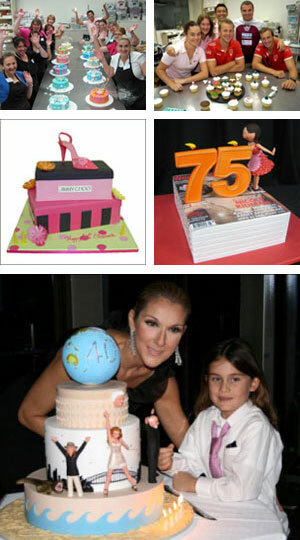 (image caption)Singer Celine Dion: Planet Cake helped Celine Dion celebrate her 40th birthday with an incredible birthday cake. Celine was in Sydney performing her amazing "Taking Chances" world tour. The birthday cake was vanilla (Celine's favorite flavor). The 4 realistic figurines are of Celine, Rene Angelil her husband, her mother Therese who is touring with her and her son Rene-Charles. The figurines stand in front of a painted Sydney skyline; this is adorned with a replication of the coliseum built for her in Las Vegas, and on top of the coliseum is a world globe which represents her current world tour and a diamante sits on Quebec where Celine was born. © Copyright 2007 - 2009 Perfect-Wedding-Day. All Rights Reserved.